Tara Brennan has always been an outsider, moving to different schools, blending into the background. The one time she tries to fit in with the popular crowd, she gets caught stealing a goat and is sent to live with her younger cousin’s family for the summer. For Tara, it’s just one more move that she needs to survive, but the residents of Willow Falls won’t let her slide by unnoticed. She quickly falls in with a crew of quirky friends and meets Angelina D’Angelo, a mysterious old woman who tasks Tara with collecting thirteen gifts before her thirteenth birthday, in order to protect her soul. 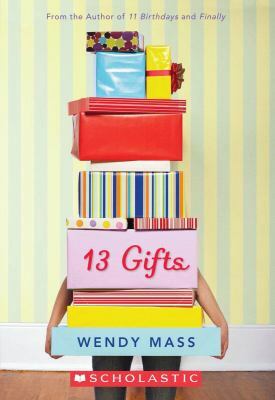 13 Gifts is the third novel in Wendy Mass’ series about Willow Falls. Having not read 11 Birthdays or Finally, I was initially overwhelmed by the eccentric cast of characters. Everyone has a quirk, from Rory (of Finally fame) who is dating a movie star, to Leo and Amanda (of 11 Birthdays) who can only communicate with each other via chalkboards that they wear around their necks. The temptation is to put 13 GIFTS aside in favor a book that is easier to follow. Don’t give up-- this sweet story is satisfying and will make readers want to catch up on the rest of the series. Willow Falls is a special place, similar to Stars Hollow of The Gilmore Girls. All of the community members are connected and open, which is the perfect setting for Tara to gradually come out of her shell. Mass never hammers the theme of friendship; she shows how being included and accepting the help of others makes a huge difference in the life of a lonely girl. Tara’s insecurities will be instantly relatable to middle grade readers who will enjoy the innocence of a first crush and the satisfaction of pulling off a big project. Wendy Mass’ books are extremely popular with my sixth grade students, who trade and recommend the titles to each other. I highly recommend reading the first two Willow Falls novels before starting 13 Gifts so you can fully appreciate Tara’s adventures in this strange but wonderful town. This review was cross-posted at Young Adult Books Central.